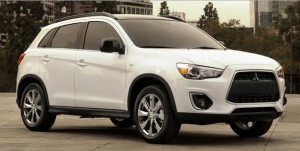 Mitsubishi took its time and development an all-new, 5-seater 2013 Outlander Sport model that meets all of these criteria. With a bold looking design and an aggressive grille, it’s one of the best looking models in its class. If you’re in the market for a new crossover SUV, we invite you to stop by Lovering Mitsubishi in Concord to test drive the 2013 Outlander Sport and learn about all the different options it has to offer. Let’s take a quick look at a little bit of what the Outlander Sport has in store for drivers. The Insurance Institute for Highway Safety, one of the industry’s most trusted names in vehicle safety testing, has awarded the new Outlander Sport a “2013 Top Safety Pick+” award. Vehicles are awarded a “+” if they get top marks in at least 4 out of 5 tested categories, with no less than an “acceptable” in the 5th. With the rear seats up, the Outlander Sport has a total cargo area of 21.7 cubic feet (that’s if you choose to go without the subwoofer.) With the seats down, you can increase the cargo area to an impressive 49.5 cubic feet. If you’re interested in a test drive, we encourage you to stop by our dealership. We’re located at 93 Manchester Street, in Concord, just a mile west of the Merrimack River. If you have any questions, please don’t hesitate to give us a call. In the meantime, feel free to explore how Mitsubishi accessories take the Outlander Sport to the next level!